CALL (209) 835-2225 TODAY ! For over 20 years, patients in Tracy, Mountain House, Manteca, Lathrop and surrounding San Joaquin County, CA communities have trusted us to provide their families with professional chiropractic and spine care. 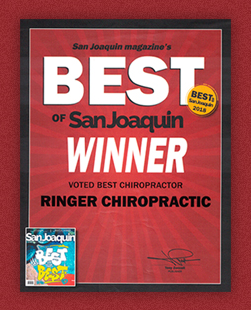 Our Tracy chiropractor, Dr. Ringer, is proud to have been voted “Tracy’s Best Chiropractor” because of his experience, training, and unique approach to provide you with the fastest results possible. By combining the latest techniques in chiropractic, manual medicine, physical therapy, massage, exercise, and nutrition, we provide true pain relief, whether it's for back pain, neck pain and stiffness, sciatica, auto accident injury, foot pain and more! Our expert care, on-time scheduling, and affordable fees will leave you completely satisfied. 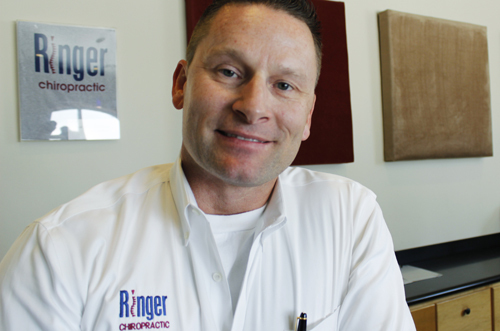 Ringer Chiropractic… Come visit “Tracy’s Best Chiropractor” Today! If you are new to seeing a chiropractor and want to find out more, please email us or call (209) 835-2225 to receive personalized answers to your questions from our friendly team. We also welcome referrals, so we invite you to share our chiropractic and wellness information with your friends and loved ones. To request an appointment, please complete the form below .